When it rains, water will come from the Messum Crater into the riverbed. The crater was named after Captain W Messum, who was an explorer of the coastal regions of Southern Africa from 1846-1848. On the way to the Messum Crater Mr. Monkey saw so many Lichen. Lichen are organisms that represent a mutualism between algae and fungi. 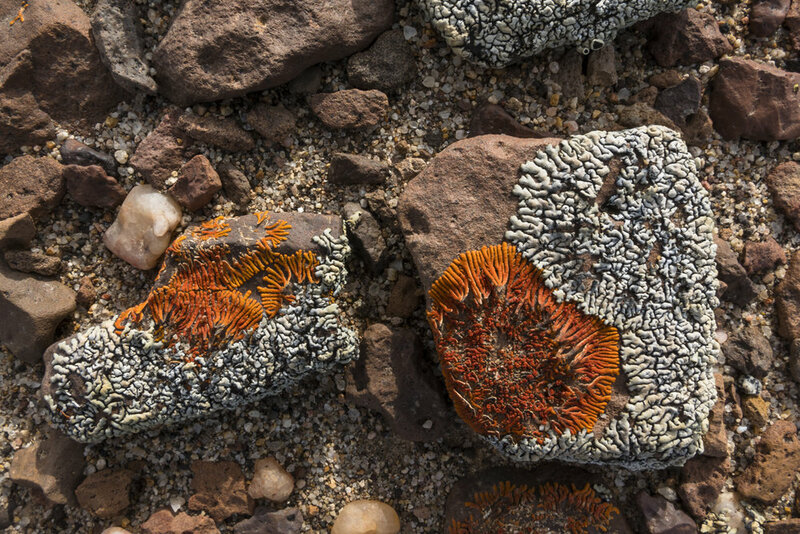 There are more than 100 different lichen species found in this area of Namib. Lichen are very sensitive and can be destroyed easily. People and the use of vehicles need to be limited around Lichen fields to help preserve them. Botanically wild Tsamma melon are the same species as watermelon. There are sweet varieties that can be eaten raw just like watermelons. The more They more bitter ones can be cooked over coals, which will soften the flesh. Tsammas are very drought-resistant which makes them a great source for food and water in the desert. These melons can be up to 90% water!! That certainly can help in the dry, hot desert!! Mr. Monkey was very interested in these cracked rocks! It is so hot and dry in the desert! !